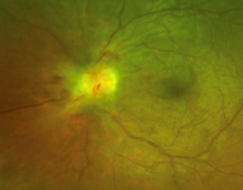 Figure 1: Left eye fundus photo at current presentation shows disc edema, retinal (Paton’s) folds, and peripapillary hemorrhages. 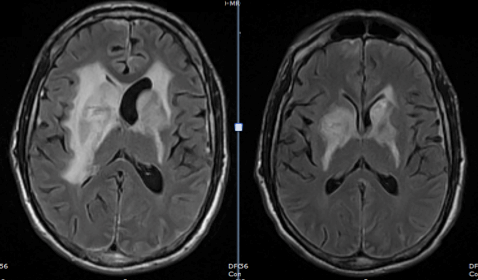 Figure 2: T2-FLAIR axial view MRI on left shows marked progression of signal abnormalities in deep parenchyma, compared with more subtle changes noted 3 months prior, pictured on right. Figure 3: T2-FLAIR axial view demonstrates new involvement of the optic tracts (arrows) and surrounding tissues (left image). The right image is T1-post-contrast orbital MRI, axial view showing subtle enhancement of the left > right optic nerve/sheath complex suggesting some degree of inflammation/infection/infiltration. Figure 4: IVFA left eye shows disc leakage and inferonasal vascular non-perfusion consistent with a focal BRVO. With the determination of normal ICP, it was concluded that the optic neuropathy was most likely related to infiltration and inflammation of the optic nerves secondary to worsening cryptococcal infection rather than the more commonly seen scenario of papilledema secondary to elevated ICP from cryptococcal meningitis. It is estimated that approximately 75% of patients with cryptococcal meningitis will develop elevation of ICP (often severe) thought to result from the depositing of proteins and inflammatory by-products along the arachnoid granulations. This impairs absorption of CSF. In our case, the hypothesis of worsening cryptococcal infection was supported by the observed increase in enhancing cystic lesions on follow-up brain MRI. There is also likely a component of IRIS given the patient’s history of cryptococcal infection and re-initiation of HAART 3 months prior. The worsening parenchymal edema on MRI is consistent with this heightened inflammatory response. 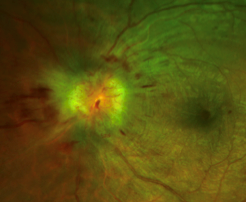 Figure 5: Left eye fundus photo 2 weeks after initial presentation shows improvement in disc edema and peripapillary hemorrhages while on anti-fungal treatment and prednisone. Park BJ et al. Estimation of the current global burden of cryptococcal meningitis among persons living with HIV/AIDS. AIDS. 2009 Feb 20;23(4):525-30. Desalermos A et al. Update on the epidemiology and management of cryptococcal meningitis. Expert Opin Pharmacother. 2012 Apr;13(6):783-9. Perfect JR. Clinical practice guidelines for the management of cryptococcal disease: 2010 update by the Infectious Diseases Society of America. Clin Infect Dis. 2010;50(3):291. Portelinha J et al. 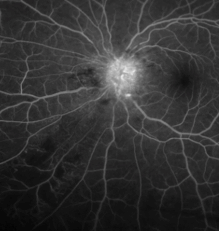 Bilateral optic neuropathy associated with cryptococcal meningitis in an immunocompetent patient. BMJ Case Rep. 2014 Jun 11;2014. Merkler AE et al. Direct Invasion of the Optic Nerves, Chiasm, and Tracts by Cryptococcus neoformans in an Immunocompetent Host. Neurohospitalist. 2015 Oct;5(4):217-22. DeSimone JA et al. Inflammatory reactions in HIV-1-infected persons after initiation of highly active antiretroviral therapy. Ann Intern Med. 2000;133(6):447. French MA et al. Immune restoration disease after the treatment of immunodeficient HIV-infected patients with highly active antiretroviral therapy. HIV Med. 2000;1(2):107. Khurana RN et al. Ophthalmic manifestations of immune reconstitution inflammatory syndrome associated with Cryptococcus neoformans. Ocul Immunol Inflamm. 2008 Jul-Aug;16(4):185-90.